In Berlin this week our Brexit Secretary, David Davis, attempted to give a lecture to the Germans. “Don’t put politics above prosperity,” he said. That seems rich as the ideology of Brexit means doing exactly that: putting politics above the prosperity of Britain. But there were other oxymorons in Mr Davis’s speech. He said he hoped for a deal with the EU that “allows for the freest possible trade in goods and services”. Actually, Mr Davis, that’s exactly what we have now. He also said he thought it “incredibly unlikely” there would be no deal with the EU. But the way Mr Davis is handling the negotiations, that outcome is now looking extremely likely. Mr Davis seems deluded. Passing wind is not going to solve anything. Mr Davis added that the UK was seeking a “deep and comprehensive free trade agreement” of a scope the EU had never seen before as well as “continued close co-operation in highly regulated areas such as transport, energy and data”. Unfortunately, however, none of this is really funny. Possibly Mr Davis hasn’t got or understood this message, but he should. 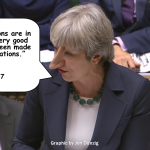 The above quote comes from his boss, Theresa May. 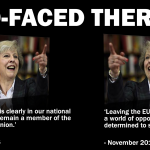 She said it when she was batting for Remain last year. Now, the entire Cabinet seems batty. 70% of them supported Remain in last year’s referendum. None of them can properly explain why they so dramatically switched sides, undoing all their warnings of how bad Brexit would be for Britain. Would you ever trust that doctor again? Everyone should know by now that Brexit is all about putting politics above the interests of the nation, and our prosperity. According to experts Brexit will hugely damage Britain’s prosperity. Ok, Brexiters don’t believe experts, because Brexit is a faith – which means believing in something for which there is no evidence. However, we do have evidence about the impact of Brexit, whether it’s believed or not. For example, in-depth research by the Institute of Public Policy Research published in December 2016 demonstrated that Britain faces a decade of disruption after Brexit, with low growth, stagnating incomes for the poor, and the public finances at breaking point. The independent research organisation predicted that by 2030, our economy is forecast to be up to £55 billion smaller than it would have been without Brexit. “Brexit will profoundly reshape the UK. It will be a fundamental break in the existing political-economic order. Painful trade-offs are almost certain. Growth is expected to be lower, investment rates worse, and the public finances weaker as a result of Brexit. Another independent report, by the Centre for Economic Performance which is part of the LSE, starkly concluded that Brexit (when it happens) will result in an average loss of income across the board of between £754 and £5,573 a year. And what does Mr Davis say? Not a lot. He and his department for exiting the European Union have not been able to publish any Brexit impact reports, even though last month he boasted he had 58 of them covering almost every sector of British industry. Parliament voted to see them without delay. 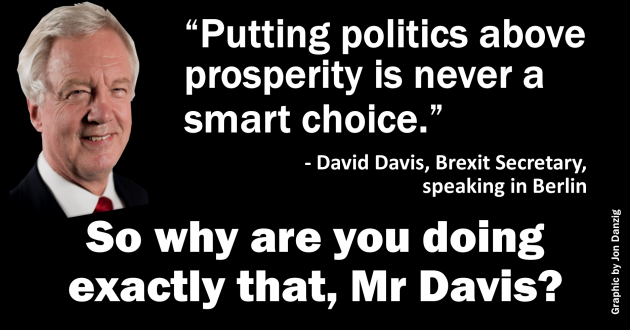 The real problem is that Mr Davis knows his Brexit reports will upset us, ‘the people’. That’s because they almost certainly concur with the findings of the IPPR and LSE reports, and many other ‘expert’ reports that have come to the same conclusions: Brexit will damage our country and prosperity. Anyway, the EU knows whats going on. Whilst Mr Davis has been unable to produce any Brexit impact reports, the European Parliament has already commissioned and published 24 of them. It’s worth pasting here the rest of the key findings from that March 2017 EU report, because they are so clear, so open, so accurate, and so bloody sobering. 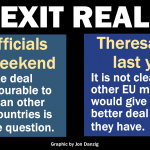 ‘..even on the most optimistic scenarios, the Brexit deal will be fairly hard. One reason is that the British government’s strategy is not about achieving economically optimal outcomes. ‘Many EU leaders are rather franker than the British government on this point. They say that the cohesion, unity and strength of the EU count for much more than the loss of some trade with the UK. 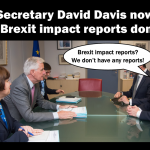 Mr Davis, it’s clear from reading the above report, published an astonishing 8 months ago, and hearing your speech in Germany, that you are completely and utterly out of your depth. 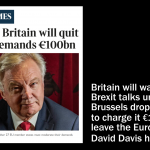 This entry was posted in Current Affairs, Democracy & Citizenship, Economics & Trade, Global & International, Law & Justice, Media & Communications, Politics & Public Policy, The EU and tagged brexit, CEPR, David Davis, European Parliament, European Union, IPPR, Theresa May. Bookmark the permalink.